I’m a wine blogger on www.nataliemaclean.com and I am also wine consultant and wine educator. La Tomate Blanche is an Italian fine dining restaurant locate Montreal South Shore. They have good wine selection from Italy and the food is delicious. I had a good service, the waiters were very professional. Steirereck Vienna, Austria! Excellent extensive wine list, good food, good service. I enjoyed duck. Also all the beautiful views I saw make that’s experience unforgettable. Moraine Lake, Alberta, Canada! 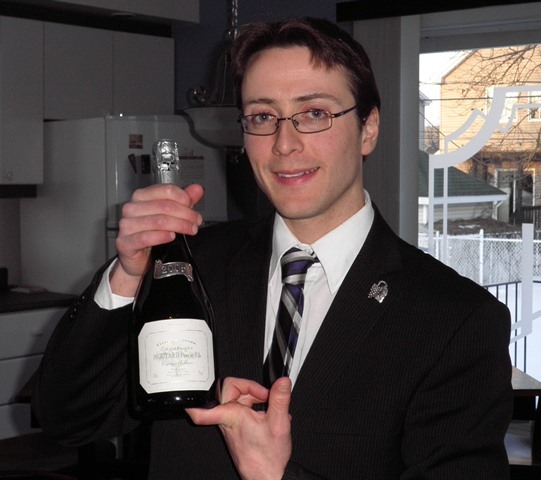 Before I became Sommelier in 2005, I was travelling North America with my family. We stopped at Moraine Lake Lodge for dinner after a day visit. It was a cool day but inside, we had a good fire place. I took the rack of lamb like main course and we ordered 2 bottles of Black Hills Estate Nota Bene 2003, Okanagan Valley, British Columbia, Canada. We had a lot of fun together; one of the best moments of my life. I love Tenka Sushi. It’s not far from home and BYO wine so I can bring a good bottle of riesling from my cellar. Yes I do! My grandmother was cook in an Italian fine dining restaurant. My mother learned from her and when I was younger I learned from my mother. Vinomania Reims, Champagne, France. They have an excellent choice of wine by the glass. Now that it is not winter, I’m tasting a lot of Canadian small wineries that I don’t know of every kind, sparkling, red, white, rose, ice wine…A lot of sparkling’s from Nova Scotia, Chardonnay and Pinot Noir from Ontario, Syrah and Sauvignon Blanc from British Columbia and even rosé and ice wine from Quebec. Absolutely, I remember that was at Montreal Passion Vin event in 2006. I was a volunteer Sommelier for this event with many others Sommeliers from Quebec. I tasted a lot of wines from different estates, but the Penfolds’s Grange 1994 from Australia was wonderful. I was hooked! Gaspereau Valley, Nova Scotia, Canada. They make good white and red but their speciality is Traditional Method sparkling. Like Binjamin Bridge who grow mainly pinot noir, chardonnay, pinot meunier and riesling to make their sparkling. Abadia Retuerta’s Rivola Sardon Del Duero, Spain. The winemakers Pascal Delbeck and Angel Anocibar are passionate about wine, like me. With their Rivola, I have never been disappointed with any vintage since I tasted it the first time. That’s a wine around 25 Canadian dollars. Matane shrimp with green peas purée and mango espuma (a kind of mango jelly), which I’ve been pairing it with Nagelsforst Weissburgunder (also known as Pinot Blanc) from Baden-Baden, Germany. It is a delicate wine with a somewhat exotic dish. I’m divided between Paso Robles, California, Wachau in Austria and Alsace, France. A glass of local fine wine, a nice view and good meal equally a good experience. Champagne Moutard 2005 (100% Arbane) Arbane grape is very rare to find. That’s a chance to discover a new style of Champagne! Henri Boillot Chassagne-Montrachet 1 er Cru Les Embrazées 2011. A true interpretation from a top Burgundy chardonnay producer. About 70 $ Ca.